Medical curriculums in the 1950s included no sociology or anthropology and the medical conditions taught matched the Australian urban environment. Sociology was learnt by osmosis, first as an apprentice, then over the years from understanding the roots of those who sought medical advice. From the early 1950s, a trickle of interested medical students and later cadets came to PNG as students and were blooded into the foreign society and exposed to the sociology of the people of our nearest neighbour. These young men and women imbibed the culture of the country in their formative years and forever had a different outlook from the majority who had their first contact when they had had five years of professional maturation. In 2011, Dr Clive Auricht and Dr Ken Clezy put on record their experiences and their contribution to a healthy planet. The months spent by Dr Ian Maddocks as a student at Malahang near Lae in 1953 and 1954 then Fiji as a graduate after 1956, and Dr Anthony Radford as a student in India in 1958 and the Highlands in 1959 opened their minds to the many differences between PNG and Australian society. Later they and their families associated with the people in the manner common to missionaries. This experience was shared by eighteen-year-old Eric Wright from a different background who, as a medical assistant, intimately associated with the community before studying medicine. As young men they learnt quickly and returned to serve the communities. As a 24-year-old graduate in 1948 in the isolated Sohano settlement with a handful of Europeans, I shared part of this experience for nine months. I still remember the names of the young Buka men who filled the key roles in the hospital but my friendships were broken when I was posted to New Ireland. Many in the hierarchy in the stultifying Moresby environment had never ever been inside the alien village world or shared a meal and conversation in a village home. This disjunct was often obvious. Starting in 1958, Eric, Ian and Anthony were the heart of the Papuan Medical College as it metamorphosed over the decade into the University Medical Faculty. They had a clear image of their objective and understood the role of the health profession in PNG and the best way to educate young people to effectively fill that role. They made a significant contribution to the establishment of the health service that was handed over at independence. Their stories explain in part why the health services led the field in replacing the colonial workers. Dr Ian Maddocks has written the history of the Motuan village that accepted and entranced him for six years. In Pari Hanua, he has described the history of Pari and the Motu people based on oral history, postcolonial records and his personal observations. He has consolidated the findings of the many disciplines that have studied these people and includes historic and geographic material. The book allows us to read and see where the Pari people came from, their relation with the Koita and the important stories of the coming of the white man. He has recorded the impact of western society on every aspect of community life over the past 130 years and illustrated it from photographic records. It is a story that every village near a centre in PNG could replicate but few if any will. It is not a memoir as only the preface, a personal note and an epilogue are used to fit the Maddocks family into the picture. Dr Anthony Radford with the help of his wife Robin has produced a massive memoir. Singsings, Sutures and Sorcery starts with his initiation and isolation at Chuave in 1959 followed by the years they spent first in Kainantu then Saiho and back to Kainantu. As a scion of the Kent Hughes medical family, Anthony had an advantage over those who were the first doctor in a family. He had family models and guidance when he chose to devote his life to the people of PNG. I remember my interviews in Adelaide in 1958 and the outstanding academic record of Anthony and others who sought appointed as cadets. Anthony recalls the planning behind his post graduate education to achieve his personal objective. The memoirs emphasize the relationships they developed with the staff and students in the Papuan Medical College and the University. The last section covers his involvement in PNG and elsewhere as an international consultant and his distress at the effect of corruption on the health of the people of PNG. ISBN-13: 9781107015944, Hardback, 322pp, published 2012 by Cambridge University Press 30 b/w illus. 8 colour illus. 10 maps, bibliography, index Cost: $59.95 Available from your local book-seller or the publisher. I think it is fair to say that in recent years Kokoda has come to have the same emotive effect on the Australian national psyche as Gallipoli. It defines Australians as individuals and as a nation. However, after having read The Kokoda Campaign 1942—Myth and Reality, by Dr Peter Williams, one has to ask how much of that definition is based on myth and how much is based on fact. I have read any number of books and articles on the desperate early days of the Pacific War, when Australians feared their survival as a people and as a nation might fall to the overwhelming force of an upstart Asian nation less than a hundred years on the world stage. It seems almost every year of late another book about Kokoda comes out. Almost all of them retell the story of how Australian citizen soldiers, poorly trained, underequipped and overwhelmed managed an almost textbook-like fighting retreat over the Owen Stanley Range in Papua New Guinea, slowing and then eventually stopping a Japanese force estimated at—depending on the book—two-to-one to six-to-one, thus saving Port Moresby and also Australia. Dr Peter Williams, in his five-year research on Kokoda, has done what all historians should do when researching and writing on any topic of historic significance. He wiped the slate clean and started almost from scratch, questioning every aspect of the campaign that others have repeatedly expounded upon as if it were part of some holy grail. To begin with, enlisting both Australian and Japanese documents, Dr Williams dispels the reader of the notion that the Diggers saved Port Moresby. He then cites numerous sources pointing to the fact that contrary to most books and articles written on the subject, the Japanese knew that Kokoda was a track and not a road, and that it led over a high mountain range. The Australians fighting against the Japanese troops of Nankai Shitai (South Sea Force) were not pushed back because they were outnumbered. Meticulously consulting Japanese sources, Dr Williams, doing the math, shows again and again that during each stage of the retreat Australian forces were up against numbers equal to what they had. Dr Williams also points out that the Japanese on Kokoda did not eventually retreat because they had run out of supplies and were starving. They were ordered back, at least temporarily, due to the turn of events on Guadalcanal that required the full attention of the Japanese military before they could focus their attentions once again on earlier objectives. Without making this too long, briefly, Dr Williams also dissuades the reader of other myths such as the use of airpower in defeating Japanese forces on the trail and the supposed better medical care received by Australians. None of the above should be seen as a denigration of the Australians of that generation who saw their fight at Kokoda as a do or die situation that would decide the fate of Australia. General MacArthur and Blamey may have known from intelligence that the Diggers were not fighting against overwhelming odds, but the bloke at the front didn’t know that. Most thought, like Brigadier Potts, that they were hundreds up against perhaps thousands. Also, as a result of having read Dr Williams’ book, I have a whole new appreciation for both Gen. Douglas MacArthur and Gen. Thomas Blamey, two rather enigmatic yet controversial individuals. Dr Williams also reminds the reader that Kokoda was not a battle of and within itself, as if it was something organic. Everything at Kokoda, as Dr Williams points out, had to do with other events—the Battle of the Coral Sea, Milne Bay, and most importantly the large force of U.S. Marines that landed on Guadalcanal on 7 August 1942, and their subsequent defeat of all Japanese attempts to remove them. ISBN 9781742372709 Hard Cover Published by Allen & Unwin. 528pp. Cost: $49.99. Order from the publisher or purchase from your local bookseller. Many of us, I'm sure, have taken the opportunity of walking in the cloisters of the Australian War Memorial's Roll of Honour. There are 40,000 names, or thereabouts, of the Australian dead of the Second World War. As I've often lamented, it is impossible for each of us to know the details of even more than a handful of these men and women. Phillip Bradley has done that work for those Australians who fought in New Guinea from 1942 to 1945. His research and work on the ground is inspiring and impressive. here have been many books about the fighting in New Guinea over the past few years and those of Peter Brune stand out. Gritty, informative, angry even. In War Horrors for diggers in New Guinea, Phillip Bradley set himself an important task. What about, he wondered, putting all the battles in which the Australians fought in New Guinea into the one book. Why separate Kokoda from Wau or Shaggy Ridge? Why not tell of the last Australian fighting on Bougainville or Wewak as the war came to an end, as well as the very first of the fighting on New Britain and New Ireland? For the New Guinea battlefields were the same place essentially. Soldiers faced the same awful conditions in which to fight, they faced the same fanatical enemy. Taking all the battles together, Bradley is able to show the "generational change" in the three years of the fighting, as few, either leaders or soldiers, would last long in the appalling conditions. Bradley gives you the feel, from the very start of his book, for just what a hellish place this was to fight a war. It was a neat idea, the first single book to tell the whole story of the Australian fighting in New Guinea across the whole war. And it works, up to a point. There is a sense of rush, or of urgency, in the writing which is a bit breathtaking. There is almost an encyclopaedic feel to this book. Each episode of the war is dominated by those who were killed or were wounded, and there is little opportunity for pause and reflection. There is plenty of time, though, for a few key themes to emerge. The first is the astonishing bravery of the Australians and their extraordinary capacity to endure and to keep on giving. Readers of this book will share, I believe, Bradley's intense pride in the qualities of the Australian soldiers of the Second World War. They will be infuriated, though, by elements of the leadership the Australians had to endure. I can't say I'm always in agreement with Bradley's judgments, and I'm more than surprised by his distaste for Brigadier Arnold Potts, whom I'd thought to be one of the genuine performers. The third theme to emerge is of the variety of ways to be killed in this hellish place. Death stalks every page of this narrative. Men are shot, obviously, they drown, are swept out to sea, waiting in trucks men are incinerated by a crashing aircraft, other men plunge to their deaths as they struggle up precipitous ridges, and men die of exhaustion. The tribes and clans of the Galkope have occupied the steep mountain slopes and valleys of the southern part of the Simbu Province in Papua New Guinea for countless generations. Kela Kapkora Sil Bolkin spent several years trekking through his traditional homeland talking to people about their origins. The primary foci of his enquiries were the traditional men's huts, where the elders and sages of the Galkope recounted, interpreted and handed down their stories from the past. Through these old men it has been possible to delve back several hundred years into the mists of time to the very moments of the inception of the Galkope as a distinct people. 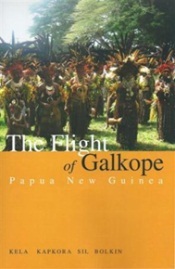 From that time when mythical beings and legendary warriors touched shoulders in the high mountainous interior, the story is brought slowly and carefully forward to the near present when the Galkope began their flight to the four corners of Papua New Guinea in a great diaspora. The journey includes the exploits of the legendary explorer and founder, Alai Bia, and his quest for new lands, the story of Warmil and his spirit-wife and Sipa, the munificent half-man, half-raptor, through to the arrival of the first Christian missionaries and the eventual disintegration of the Galkope under the incessant plague of inter-tribal warfare and the bane of the new politics and economic imperatives of an independent Papua New Guinea. Today over half of the Galkope live outside the Simbu. The importance of the men's huts and their sages has diminished. The magnificent valleys and mountains now sit in the aura of a silent sun and the rivers and streams flow over the pebbles of a lost time. The Flight of Galkope is an attempt to salvage those memories and render them in a form for the modern age so that the Galkope will be able to understand where they come from and what made them. Kela Kapkora Sil Bolkin's book is meticulously researched and is a distinctly Papua New Guinean historical account. Sil was encouraged in the early stages of his research by PNGAA member Barry Creedy, while Phil Fitzpatrick helped with the editing. Sil was born in the Galkope of the Simbu Province of Papua New Guinea. He studied to become a Catholic priest but quit soon after completing his philosophical studies and attended the University of Papua New Guinea. He has a Bachelor of Arts degree majoring in Social Development and Anthropology. Added to his credentials is a certificate of Leadership in Strategic Health Communication from the Johns Hopkins University (USA). He is now the Senior Policy Analyst at the National AIDS Council Secretariat. Japanese troops in Papua New Guinea during World War II murdered a group of Christians who became known as "The New Guinea Martyrs". The Reverend Vivian Redlich, an English missionary priest, was believed to have been in this particualr group, but following new evidence, his brother Patrick has painstakingly pieced together Vivian's life and the known details of his death. With the truth acknowledged, reconciliation between descendents of the perpetrators and the Redlich family took place in 2009. Among the martyrs were Vivian's fiancée May Hayman, a nurse and Mavis Parkinson, a teacher.